Jaipur, the Pink City of Rajasthan is one of the most popular tourist destinations in India. It is loved by all for a reason. Relics of Rajasthan's royal history can be witnessed at the city in all its glory. Walking through the streets of this city certainly transfers one back in time. Due to the architectural magnificence of forts, palaces and havelis, it is only natural for a tourist to turn a blind eye to other beautiful places of the city. One such quaint place is the Galtaji Temple, located just 10 km from Jaipur, in a small town called Khania-Balaji. Galtaji Temple is perched at a good height on the Aravalli range due to which a breathtaking panoramic view of Jaipur can be seen from here. It is a place of Hindu pilgrimage ever since the 16th century. It was built by Diwan Rao Kriparam, who was an advisor of the Rajput ruler Sawai Jai Singh II. The temple is built using pink sandstone and has painted walls. It has beautifully carved pillars and roofs that are rounded. It is a complex of a few other temples, of which, the main temple is dedicated to Lord Hanuman. Temples dedicated to Lord Rama and Lord Krishna are also found. It is set against a splendid backdrop of lush green vegetation that is filled with waterfalls and pristine natural beauty. This beautiful temple is built in such a way that it looks more like a palace than a place of religious significance. Galtaji Temple is often referred to as the Monkey Temple, due to the large number of monkeys that are found here. Visiting the temple at dusk is a great idea since you can witness some of these monkeys playing around the temple. One of the attractions of the temple is the natural spring that flows into the temple. The holy natural spring water, flows from a hilltop and into the temple. 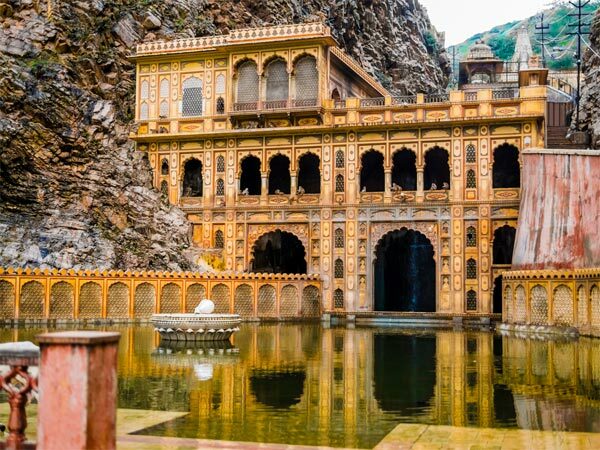 The place has 7 different kunds or water tanks and out of that, the Galta Kund is considered most sacred and significant, since it has never been dry. These water bodies are used by pilgrims to take a bath. The Hindu festival, Makar Sankranti, is celebrated with grandeur in this temple, which is when many pilgrims crowd the place. Therefore January 14th or 15th is the ideal time to visit Galtaji Temple. The temple remains open all day long. Apart from visiting the temple for its religious significance, it is a hub for photographers since stunning pictures can be shot here. By Air: Jaipur Airport is the closest airbase, which is located at a distance of 23 km from the temple, in Sanganer. It is well connected to important cities of India like Bangalore, Mumbai, Kolkata, etc. By Rail: The closest railhead, which is the Jaipur railway station, is well connected with many places of India including small towns and big cities. Delhi, Bangalore, Chennai, Patna, Udaipur, Lucknow, Ludhiana, etc. are some of the places connected to Jaipur. By Road: Road trip from Delhi is a popular activity, due to the smooth Delhi-Jaipur National Highway. Apart from Delhi, Jaipur is well connected to other parts of Rajasthan and neighbouring states via well-maintained roads.